On April 25, 2014, astronomer Kevin L. Luhman announced the discovery of an extremely dim brown dwarf around 7.2 +0.8/-0.7 light-years (2.20+0.24/-0.20 pc) from our Sun, Sol, using infrared images collected by NASA's Wide-field Infrared Survey Explorer (WISE) . Designated WISE J085510.83-071442.5 (but can be shortened to WISE 0855-0714), the substellar object is the fourth closest to the Solar System. 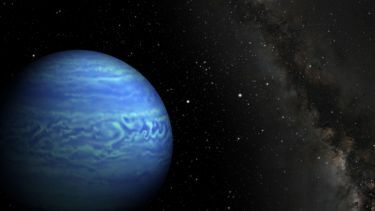 At an estimated temperature between minus 54 and 9 degrees Fahrenheit (minus 48 to minus 13 degrees Celsius), the object is the coldest brown dwarf discovered as of April 25, 2014, as the previous coldest dwarfs were no colder than room temperature. Also the reddest as well as coldest brown dwarf known, it should probably be classified as a "Y" dwarf (NASA JPL news release; NASA science news; and Kevin L. Luhman, 2014). seven light-years of Sol (more). 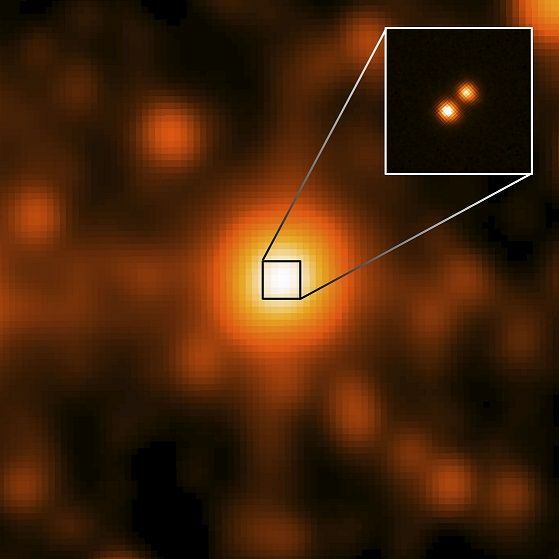 On March 11, 2013, an astronomer revealed the discovery of a pair of brown dwarfs within seven light-years of Sol. Designated WISE J104915.57-531906 (but shortened to WISE 1049-5319), the binary system was found using infrared images collected by NASA's Wide-field Infrared Survey Explorer (WISE) during a 13-month period ending in 2011, which every point in the sky was observed two to three times. An extremely dim object with high proper motion was found in several images, when archival observations from older telescopic sources were consulted. Further observation revealed that the object was actually a binary system (NASA news release; PSU news release; and Kevin L. Luhrman, 2013). within seven light-years of Sol (more). Including Sol itself, only 12 stellar objects (including the white dwarf, stellar remnant known as Sirius B) and three substellar, brown dwarfs are believed to be located within 10 light-years (ly) of Sol, as of April 25, 2014. Except for Lalande 21185, astronomers believe that Sol and its current nearest neighbors were born close to or within the Milky Way's "thin disk." 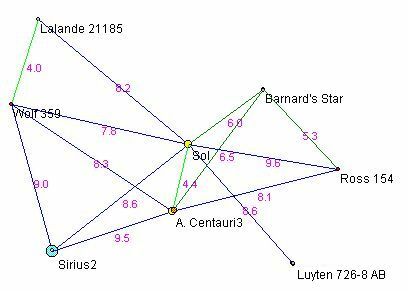 While Lalande 21185 may be substantially older than Sol, Barnard's Star may be even older, born perhaps as much as 10 or more billion years ago. By comparison, Sol is middle-aged at almost 4.6 billion years old, and the Sirius binary system is probably the youngest with perhaps around 300 million years. Seven of the 12 (58 percent) are very dim red dwarfs, of which six have been identified as flare stars and are likely to be relatively younger. 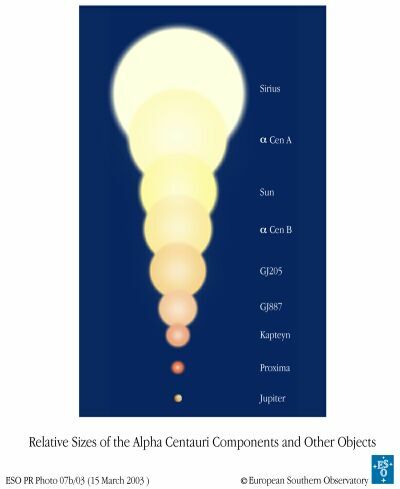 Only Sirius A and Alpha Centauri A are currently brighter, larger, and more massive than Sol. Although Sirius B is now much dimmer and smaller than Sol with about the same mass, it was once brighter, larger, and more massive than even its primary companion. The volume of space lying within 10 light-years of Sol encompasses nearly 4,189 cubic light-years. Within that enormous sphere, astronomers have detected at least 7.38 Solar-masses of visible matter bound up in 11 luminous stars and one weakly glowing white dwarf. Thus, the local density of luminous mass is low, less than 2/1,000 (or 0.00176) of a Solar-mass per cubic light-year -- not even the mass of two Jupiter-sized planets. As of October 2012, astronomers have been able to detect planets in the Solar System and around Alpha Centauri B and Lalande 21185 among the nearest 12 stars. Other than Sol itself, however, only Alpha Centauri A and B may possibly be capable of hosting Earth-type planets in stable orbits within their respective circumstellar habitable zones (CHZs). Within a CHZ orbit, liquid water may be possible on a planetary surface without tidal locking and orbital disruption from another celestial object. The following stars are located within 10 light-years (ly), or 3.07 parsecs, of Sol. 0.00 Sol G2 V 1.000 ... 8+ planets, dust, brown dwarf b? 4.22 Proxima Centauri M5.5 Ve 0.123 Centaurus Flare star; brown dwarf b? 8.31 Lalande 21185 M2.1 Vne 0.46 Ursa Major Flare & thick disk star; 3 planets? Summary information on stars and related celestial objects within 20 light-years and within 10 parsecs (32.6 light-years) are also available.